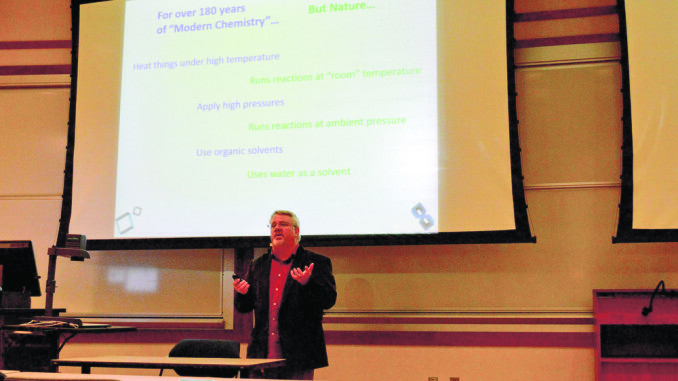 Creative and sustainable thinking is the missing element that is provided by Green Chemistry, according to distinguished chemist John Warner, Ph.D.
Warner, co-founder of Green Chemistry, visited Wittenberg on Feb. 18 as part of the Wittenberg Series. The Wittenberg Series is a selection of cultural activities annually presented by Wittenberg University to students, faculty and community members. Warner is a recipient of the Perkin Medal, the highest honor in American Industrial Chemistry. He is a graduate of the University of Massachusetts, Boston, where he received his Bachelor of Science, and Princeton University, where he received his Ph.D. in Chemistry. Warner’s presentation focused on his contribution to the creation of Green Chemistry as a field of study and a way of conducting chemistry. Warner explained that the birth of Green Chemistry came from his realization that, while he had been taught what hazardous chemicals were and how to deal with them, he had never been taught what makes a chemical hazardous. Green Chemistry, according to Warner, is a paradigm shift. It is the ability not to just learn to effectively deal with and regulate the use hazardous material, but to think outside of the box and create products without using hazardous material. “We need to talk about what we should be doing, not what we shouldn’t be doing,” Warner said. Green Chemistry, according to Warner, does not rely on the government for regulation of products that contain hazardous substances, but finds ways to create products that do not contain these substances, such as new formulas for asphalt and hair dye. This process of innovation is more sustainable both environmentally and economically. To the enjoyment of the students present, Warner shared much of his journey as a scholar, from receiving a D in his high school chemistry class and attending college originally as an art major to becoming the successful chemist he is now. “It was nice to know that he went through struggles as well to discover his passions, and that I can do it, too,” junior Carly Bockhold said. Warner stated that the piece of work of which he is probably most proud is the development of the “12 Principles of Green Chemistry.” According to Warner, this is what takes Green Chemistry from a policy to a science. In addition to developing the principles of Green Chemistry, Warner worked to establish the first Ph.D. program in Green Chemistry at the University of Massachusetts, developed the Warner Babcock Institute for Green Chemistry alongside Jim Babcock, and founded the Beyond Benign Green Chemistry Education Program. Warner believes that Green Chemistry provides hope for the future and has the potential to be a job that young kids look to when they want to make a difference in the world. Warner’s lecture was a part of the LBM Endowed Lecture in the Sciences, which are designed to enhance the role and image of science on liberal arts campuses by bringing in distinguished scholars.